What is Thunderbolt 2? How Does it Compare to Thunderbolt? Thunderbolt technology, developed by Intel®, was commercially introduced on the Apple® 2011 MacBook Pro using the same Apple‐developed connector as Mini DisplayPort, which is electrically identical to DisplayPort1, but uses a smaller non‐locking connector. Thunderbolt exists as (4) fully independent 10Gbps channels ‐ two upstream and two downstream. One channel pair (send and receive) is reserved for either PCIe or DisplayPort which are then muxed (multiplexed) over the cable. This means you can send one or the other over each channel limiting max performance for a single storage device to 10Gbps (minus overhead). It similarly limits the max display bandwidth to 10Gbps as well. 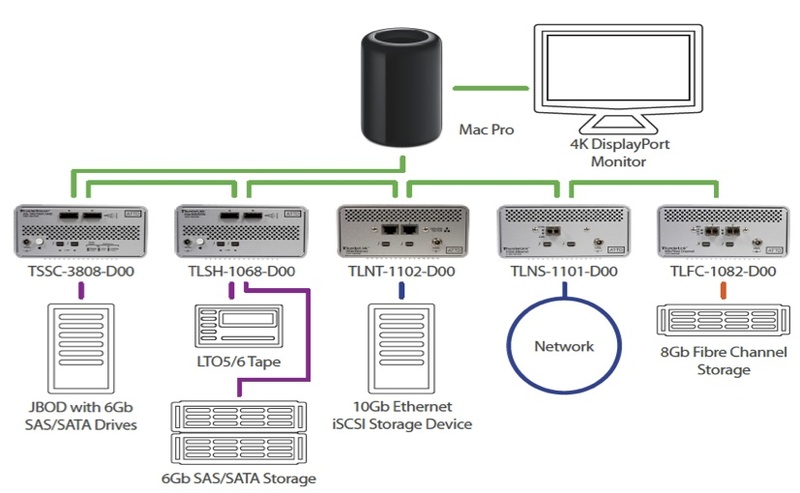 Because there are (2) independent connections, one each for PCIe and Display Port, it lends itself well to daisy chaining a display and storage device, as each Thunderbolt connection provides guaranteed bandwidth of 10Gbps. A single Thunderbolt port supports up to six Thunderbolt technology‐enabled devices via hubs or daisy chains. Thunderbolt 2 is simply Thunderbolt technology with channel bonding and full DisplayPort 1.2 (4K video support). By combining the channels together over the Thunderbolt cable, Thunderbolt 2 enables (2) 20Gbps bi‐direction channels (see right side of above diagram) instead of (4) of 10Gbps channels. Although there is less overhead, making transfers more efficient, there is no overall increase in bandwidth or total data/signal rate transfer over the cable. Since there is 20Gbps of bandwidth per channel, you can stream 4K video over Thunderbolt 2 which requires 15Gbps depending on refresh rate. Furthermore, you can bypass Thunderbolt and solely send DP 1.2 over the Thunderbolt cable as it will also serve as a Display Port cable. Please be aware that the bandwidth is shared, so it is not practical to share a single Thunderbolt 2 connection for both 4K video and high‐speed storage. At any given moment, one channel per link is reserved for display, and total device bandwidth cannot exceed 10Gbps (Note: bandwidth is shared between DisplayPort and PCIe, thus 10Gbps links are multiplexed to get a total aggregate bandwidth of 20Gbps). A more practical use case is to direct connect the 4K video monitor to its own independent Thunderbolt 2 port or use a DisplayPort 1.2 connection. 4K output is possible with current generations of Thunderbolt, but not over a single cable. This is achievable for all displays, except the newest 4K displays, by making use of 2x DP 1.1a (multiple DVI/HDMI) links.  20Gbps Thunderbolt 2 technology‐enabled devices are backward compatible with 10Gbps Thunderbolt technology‐enabled hosts. It works!  Overall aggregate performance for Thunderbolt 2 is the same as Thunderbolt.  A single Thunderbolt 2 or multiple DP1.1a connections will support 4K video performance.  Overall storage throughput still depends on the quantity and types of drives that are connected.  It’s not practical to daisy chain a 4K monitor and high‐speed storage. Independent connectionsare required! Posted in ÁltalánosTagged Thunderbolt, Thunderbolt 2Bookmark the permalink.